Late in the day on October 7, 1963, the first Learjet* 23 (N801L) took flight for the first time in Wichita, Kansas, just before the sun slipped below the prairie horizon. Test pilots Bob Hagan and Hank Beaird knew instantly that they had a winner. The sleek jet, with an elegant design years ahead of its time, flew like a dream. Its systems performed flawlessly and it accelerated on takeoff faster than any jet, civilian or military, they had ever flown. By the time they were ready to land, the skies were nearly dark but hundreds of headlights sparkled below at the Wichita airport. A local radio station reported that the Learjet was making its maiden flight, and people jumped in their cars to see the sight. 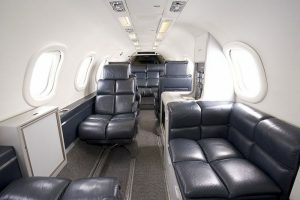 Many were spouses and children of Learjet employees, who had worked round the clock for months and were as invested in the jet’s success as the company’s founder. The crowd cheered. Grown men cried. The jet that couldn’t be built was everything it was supposed to be and more. The Learjet was on its way to defining a new category of aircraft, and becoming an enduring icon of business aviation. William P. Lear was born in 1902 in Hannibal, Missouri, and grew up in Chicago, dropping out of high school to tinker with radios and dream of airplanes. He made a living building radio sets and developed a coil design that attracted the attention of Galvin Manufacturing Company, where he became chief engineer. Bill Lear and Paul Galvin set out to develop the first car radio and brainstormed the name “Motorola”. The project resulted in Lear’s first patent and, by 28, he was a leading innovator in radio technology. 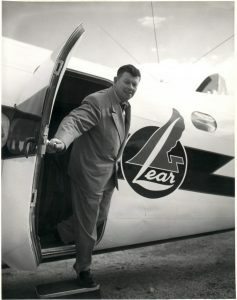 In 1932 Lear sold his company to Galvin and turned his attention to aviation. He went on to develop the first automatic direction finder (ADF) for aircraft, the first autopilot, the first automatic landing system and the first two-way radio for private planes. The dynamic Lear made and lost several fortunes, but by the 1950s he was an established figure in American business and a millionaire who held more than 150 patents. 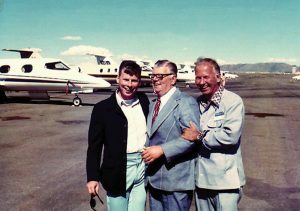 In his late fifties, with Lear Inc. a major player in avionics, Bill Lear began thinking about building a moderately priced small jet designed specifically for the business market. Corporate aircraft at that time were principally reconfigured surplus military aircraft originally designed to carry military personnel. Lear thought they were big, slow, expensive barges. He spent two years successfully modifying a Lockheed Lodestar jet with engineers Gordon Israel and Ed Swearingen. But he believed there was a need for a nimble business jet that had a cruising speed of 500 mph, comparable to a jetliner. Lear came across a Swiss-built fighter-bomber, the P-16, which never went into production but had, among other things, a wing design he liked. Lear moved to Switzerland in 1955 and set up a new company, Swiss American Aviation Corporation. He hired Dr. Hans Studer, designer of the P-16, and integrated a team of American engineers, including Gordon Israel, Hank Waring and Don Grommesh, with members of Studer’s team. At the time, no one believed there was a sizable market for business jets. In 1962, when the Swiss jet project fell out of favor with the board of Lear Inc., Bill Lear sold his interest in the firm, which then became Lear-Siegler. Lear was on his own, prepared to invest $12 million of his personal fortune in the development of the new business jet. The prevailing wisdom was that it would take $100 million and 10 years to build the kind of business jet Lear wanted. The only way his team could do it was to skip the prototype phase and go right into production. 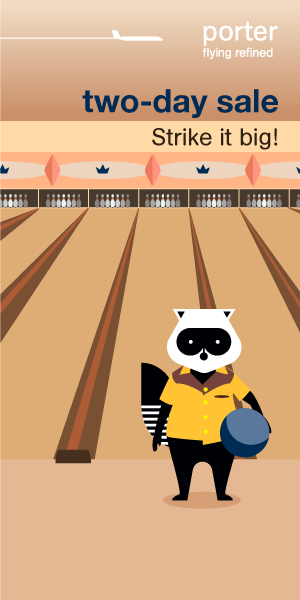 It was a strategy that left no room for error. 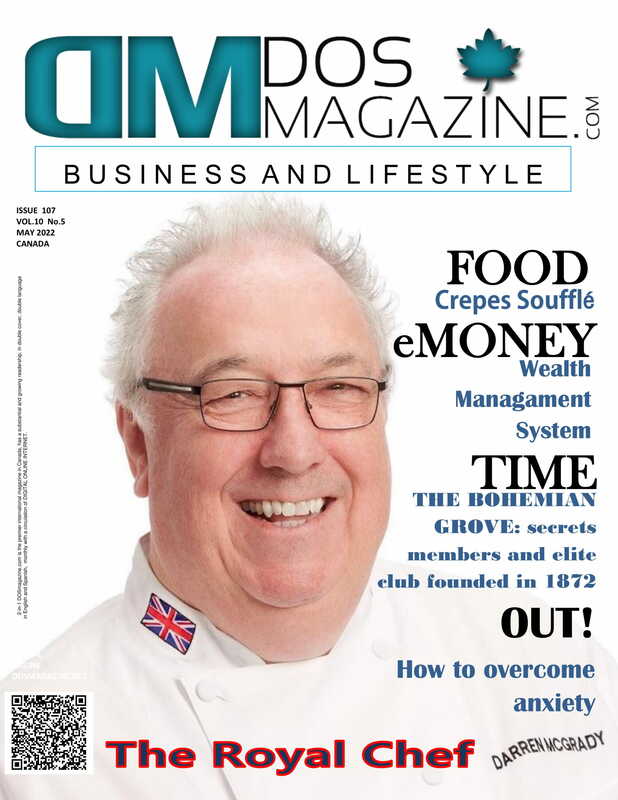 As work progressed it became clear that the different work styles of the Swiss and Americans, compounded by language barriers, made it impossible to remain in Switzerland. He selected Wichita, Kansas, as the new headquarters and broke ground on a new complex in August 1962, changing the name of the company to Lear Jet Corporation. Lear hovered over the engineering team, who stopped only to eat and sleep. They revised and re-revised according to Lear’s latest inspirations. They shaved off weight wherever possible to achieve performance targets. Their efforts paid off. 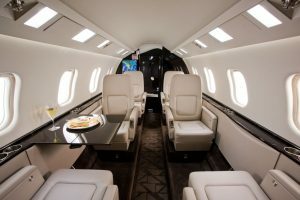 Among the innovative design features of the new Learjet were a distinctive wrap-around windshield and a unique outward-opening clamshell door, a feature that continues to adorn every Learjet built to this day. Simplicity was engineered into the instrument panel, and the cockpit included comfortable seating for pilots. Passenger seats were designed to fold down and swivel. Safety features included dual electrical systems and separate fuel lines for each engine. The only major design change at the late stages was a switch from a cruciform tail to a t-tail design, which improved stability and enhanced the jet’s spectacular silhouette. On Sept. 15, 1963, Learjet #1 rolled out of the hangar. That it was a Sunday did not stop hundreds of employees and their families from coming to watch. After the first flight in October 1963, Learjet #2 and #3 were completed and the test program progressed into the following year. A hitch occurred when Learjet #1 crash-landed in a cornfield after pilots neglected to retract the spoilers on takeoff. The pilots were fine and the plane was intact but a fuel line ignited and the subsequent fire destroyed the plane. As it turned out, it was a happy accident. Learjet #1 could never have been certified and the insurance money that Lear collected helped keep the company going as the remaining jets completed the testing needed for certification. Learjet #2 (N802L), the first actual production Learjet, was donated to the Smithsonian Institution National Air and Space Museum 14 years later in 1978, and is still on display. As certification continued, the company began to run out of money, having spent deposits received for the first 22 orders. Clay Lacy, then a United Airlines pilot, signed on as a consultant during his off-hours to help market the jet. Distributor Bob Graf came to the rescue by getting orders for another 31 jets. Minor problems and issues raised by FAA inspectors were resolved one by one. The FAA type certificate was finally awarded July 31, 1964, and the company was able to enter full production, financed by a public offering late that year. The Learjet 23 was on the market. The Learjet was a productivity tool and a hot rod. It was elegant and it was a rocket. It won over the aviation world and the business community, and captured the public’s imagination. Early buyers were primarily large corporations, but celebrity customers such as entertainers Frank Sinatra and Danny Kaye and newsman Peter Jennings helped foster its image as the ultimate plane for the jet set. 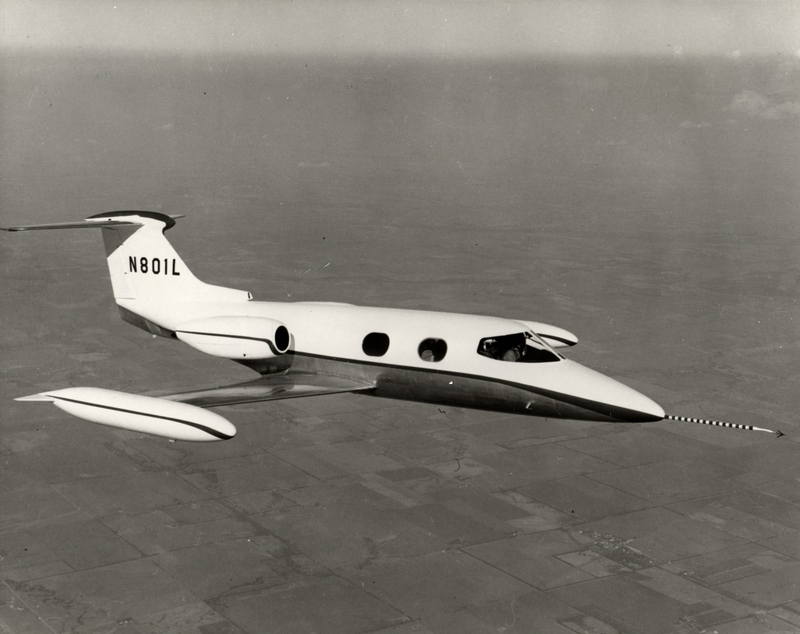 In 1965, the Learjet 23 began setting official performance records. In May 1965, a Learjet piloted by Lacy and Jack Conroy established three world speed records, from Los Angeles to New York and back in 10 hours, 21 minutes flight time, with two refueling stops. In December 1965, a Learjet flown by Hank Beaird and Ronald Puckett, with five passengers, set a time-toclimb record reaching 40,000 feet in 7 minutes, 21 seconds. With an engine thrust-to-weight ratio of 1:2.2 pounds, the Learjet could outclimb an F-100 fighter. The first new derivative, the Learjet 24, was type certified in March 1966. Shortly thereafter, a Learjet 24 piloted by Hank Beaird, John Lear and Rick King, with journalist John Zimmerman on board, set 18 international aviation records by completing a round-the-world trip in 50 hours and 19 minutes of flight. After a crushing recession in 1966, Lear sold controlling interest in 1967 to the family-owned Gates Rubber Company of Denver and the company was renamed Gates Learjet. Shortly thereafter the Learjet 25, with a larger cabin and greater range, was certified and following its introduction in 1968 set a new time-to-climb record of 6 minutes, 19 seconds to reach 40,000 feet. In August 1973 the Learjet 35, with a longer cabin and fuel-efficient turbofan engines, made its first flight, certified with the long-range Learjet 36 in July 1974. With its more comfortable cabin and superior fuel efficiency at the time of the first energy crisis, the Learjet 35/36 was the right jet at the right time. It was the most successful Learjet to date. In 1976, golf legend Arnold Palmer and pilots James Bir and Bill Purkey set another round-theworld speed record in a Learjet 36 at 48 hours and 48 minutes flight time. The following year, the FAA certified the operation of Learjet aircraft to 51,000 feet, the highest in civil aviation. And in February 1979 astronaut Neil Armstrong and Learjet test pilot Pete Reynolds set five world records for business jets, including high-altitude time-to-climb, in the widebody Learjet Longhorn 28, the first production plane with winglets. The records stood for nine years before being broken – by another Learjet. In March 1981 the Learjet 55, the company’s first medium-size jet, received FAA certification, which two years later set a new world speed record flying nonstop from Los Angeles to Paris in 12 hours, 37 minutes with one refueling stop. In the 1980s, Learjet developed the Learjet 31 and 55C, the first aircraft with delta fins. Gates continued to run Learjet until 1987 when a group of New York-based investors bought the company in a leveraged buyout deal. 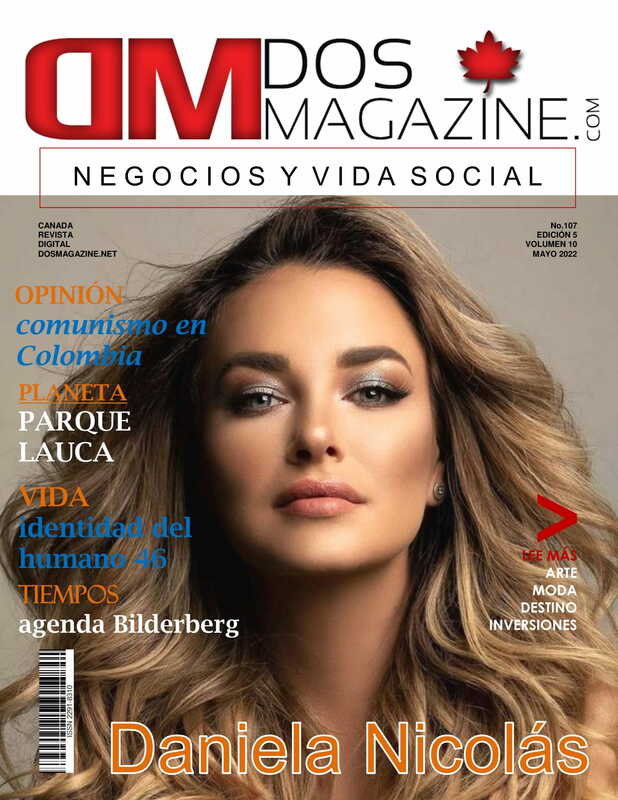 The investor company, Integrated Resources, soon faced financial troubles as a result of the tumbling real estate market and was forced into bankruptcy. Learjet’s future was uncertain. On June 29, 1990, Learjet was acquired by one of Canada’s largest manufacturing companies, Bombardier, founded by inventor and entrepreneur J. Armand Bombardier in 1942. 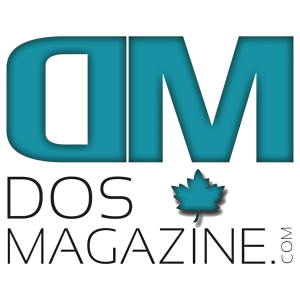 Under the leadership of Bombardier’s son-in-law, Laurent Beaudoin, who took the reins of the company in 1964, Bombardier had grown to become a diversified transportation company, including the 1986 acquisition of Canadair, manufacturer of the Challenger business jet.  Learjet was an ideal fit, and provided Bombardier with the industry’s largest family of business jets. 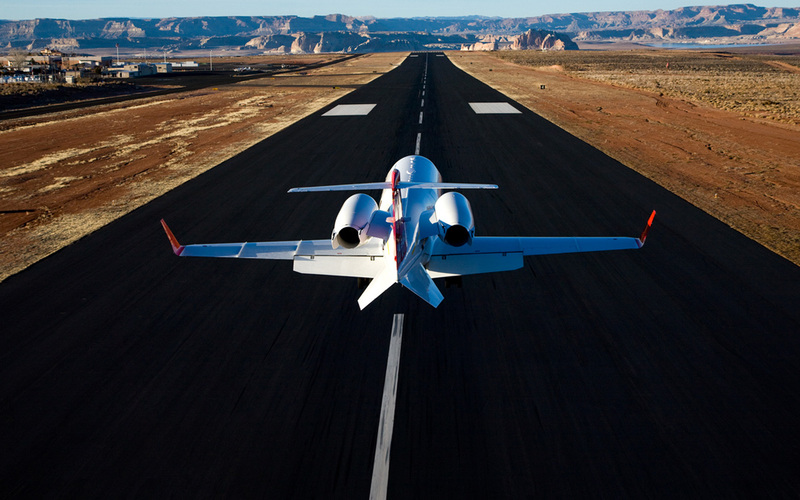 Bombardier put Learjet back on track and energized its product line. By the end of 1990, the company announced the mid-size Learjet 60 project and unveiled an enhanced version of the 31, the 31A. In 1991, Bombardier established the Bombardier Test Flight Center in Wichita, the same year the Learjet 60 made its first flight. Certified January 1993, the Learjet 60 went into service as the world’s quietest business jet, and quickly became the best seller in its category. 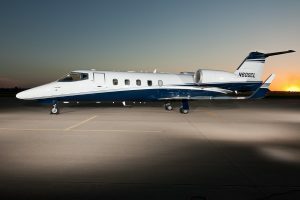 It eventually evolved into the Special Edition Learjet 60 in October 2004, offering over $1 million of the finest options and equipment as standard equipment. In 1992, Bombardier announced the new Learjet 45, the first business jet designed entirely with CAD technology and manufactured almost entirely by computer-driven equipment. On October 7, 1995, the Learjet 45 made its first flight, 32 years to the day after the first Learjet took to the skies. In June 2006, the company delivered 300th Learjet 45 and 300th Learjet 60 aircraft. On July 21, 2002, Bombardier announced a rare twin launch. The launch of the Learjet 40, a smaller version of the Learjet 45 designed to replace the versatile Learjet 31A, along with the launch of the Learjet 45 XR, to coincide with the 40th anniversary of the founding of Learjet. Deliveries of the premium Learjet 40 began in January 2004, offering legendary Learjet performance with a level of comfort and technological sophistication never before seen in the light jet segment. Designed specifically to meet customer needs in the evolving super-light business jet segment, the Learjet 45 XR continues to build upon the legendary reputation of the Learjet 45, offering improved payload-range capabilities and faster time-to-climb under hot and high conditions. 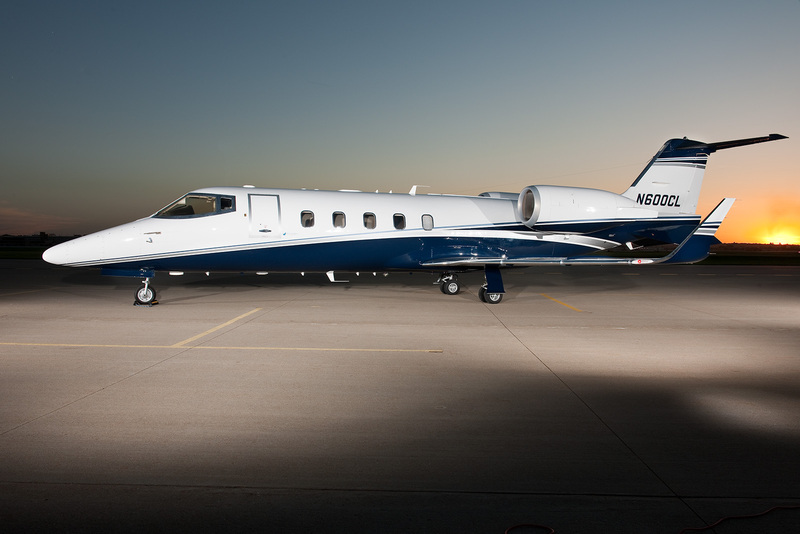 Deliveries of the Learjet 45 XR began in July 2004. In October 2004, Bombardier announced the successor to the Learjet 40 – the Bombardier Learjet 40 XR. Like the Learjet 45 XR, the Learjet 40 XR offered similar improvements such as improved payload-range capabilities. Learjet 40 XR deliveries began in January 2006. In November 2005, Bombardier raised the bar for the entire midsize business jet category by announcing the new state-of-the art Learjet 60 XR to succeed the Special Edition Learjet 60. Featuring the latest flight deck design, as well as a stylishly and extensively redesigned cabin, the Learjet 60 XR takes legendary Learjet performance to a new level of excellence. The Learjet 60 XR entered service in July 2007. Learjet aircraft have pioneered the corporate aviation market for almost 43 years, delighting owners and pilots with their performance, comfort, technology and styling. Certified to FAR Part 25, Amendment 77, the Bombardier Learjet 45 and its derivatives are now approved for civil operation in more than 43 countries worldwide. Due to their durability, speed and high operating ceiling, Learjet also has been the aircraft of choice for a wide range of special missions, including air ambulance services and aerial photography. Much of the air-to-air footage seen in movies over the past three decades, including the exciting scenes of F-14 fighters in “Top Gun,” was shot from cameras mounted in Learjet aircraft owned by Clay Lacy, a consultant on the first Learjet who owns and still flies the 12th original Learjet. Learjet aircraft have been used worldwide for medevac, air ambulance, air defense, reconnaissance, military training and high-altitude mapping. U.S. Navy and Air Force test pilots train in Learjet aircraft, as well as pilots with leading commercial airlines. Governments and corporations worldwide, including the governments of Ireland and Macedonia, also depend on Learjet aircraft. A Learjet was even temporarily deployed as Air Force One during a trip to South America by President Lyndon Johnson. The jet that was the impossible dream of a visionary dreamer was made possible by people who believed in it as much as Bill Lear did. Throughout the decades it has continued to build on its heritage thanks to new generations of engineers, designers, technicians, pilots and customers who embraced the dream as their own. And the legend lives on.